Turn to the experts to Budget Heating and Cooling for a professional installation of your gas furnace. We’ll make sure to properly size your new gas furnace to make sure it is a perfect fit for you. Choosing a home heating solution is an important decision. You want to make sure that your new gas furnace is sized properly and is a good fit for you home environment. We’ll consider not only our climate, but the size, shape and orientation of your home, the square footage, type of insulation and how much insulation as well as a variety of considerations around your windows. Then once we have a good understanding of how to properly size a gas furnace we’ll recommend a product. We’ve chosen to represent industry leaders, like Rheem. Why Rheem? Founded in 1925. Their mission is simple. Help your family enjoy a new degree of comfort with solutions that keep you cool in the summer and warm in the winter. Enjoy a reliable Rheem Gas Furnace and their broad line up of products that fit every budget and every home. 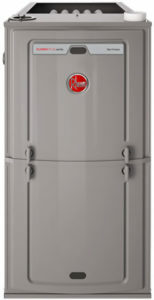 The Rheem R96P Classic Plus Series Gas Furnace was designed using the 360 degree+1 process, which means every detail of the product is meticulously evaluated from every angle. They consider the work that goes into installing and servicing their products, as well as how to deliver the very gest homeowner experience and then take it a step further. That’s 360 degree+1. You can count on your gas furnace to bring you and your family years of comfort. Chances are you didn’t choose the existing gas furnace in your home. Your needs are most likely different than the original owner. Your lifestyle is probably different, you may have more or less people in the home, and you perhaps you have pets or someone with allergies? All of these are factors when considering a gas furnace. Perhaps the original home owner chose the least expensive gas furnace and you would prefer to have a higher efficiency furnace. Or perhaps the layout of your home might have changed due to a remodeling or how you are use the space. We take all of this into account when advising you on the best furnace replacement. Oil To Gas Conversions – many of our Portland customers have decided to convert their oil furnace and are looking for a super high-efficiency gas furnace. If that’s the case for you, we are expert in upgrading oil furnace to a gas furnace and will lead the way to make sure your experience and installation is flawless. If you live in Portland, OR and are looking to upgrade your furnace, we can help. We look forward to showing you how you can substantially upgrade your home with the right heating and cooling system. We’ll help you do it affordably and without worry. You can also Get A Quote, or give us a call: 503-233-3133.